When you tap a row in a UITableView, the row is highlighted and selected. Is it possible to disable this so tapping a row does nothing? Further, make sure you either don't implement -tableView:didSelectRowAtIndexPath: in your table view delegate or explicitly exclude the cells you want to have no action if you do implement it. Because I've read this post recently and it has helped me, I wanted to post another answer to consolidate all of the answers (for posterity). I use this when I have a UIButton - or some other control(s) - hosted in a UITableViewCell and I want the user to be able to interact with the controls but not the cell itself. NOTE: As Tony Million noted above, this does NOT prevent tableView:didSelectRowAtIndexPath:. I get around this by simple "if" statements, most often testing for the section and avoiding action for a particular section. 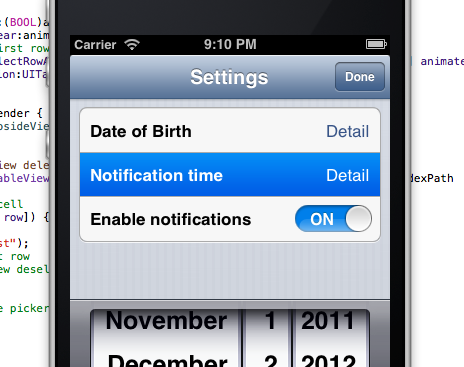 In my testing, this still allows controls inside the UITableViewCell to be interactive. 4.To make an entire table "read-only"
and you also need to ignore any clicks on the cell in - (void)tableView:(UITableView *)tableView didSelectRowAtIndexPath:(NSIndexPath *)indexPath. This method lets you mark specific rows as unhighlightable (and implicitly, unselectable) without having to change a cell's selection style, messing with the cell's event handling with userInteractionEnabled = NO, or any other techniques documented here. so it will flash the selected state and revert. In your UITableViewCell's XIB in Attribute Inspector set value of Selection to None. From the UITableViewDelegate Protocol you can use the method willSelectRowAtIndexPath and return nil if you don't want the row selected. In the same way the you can use the willDeselectRowAtIndexPath method and return nil if you don't want the row to deselect. Below snippet disable highlighting but it also disable the call to didSelectRowAtIndexPath. So if you are not implementing didSelectRowAtIndexPath then use below method. This should be added when you are creating the table. This will work on buttons and UITextField inside the cell though. It will deselect your row when needed. 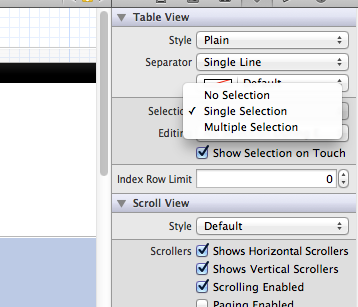 2 - Don't implement -tableView:didSelectRowAtIndexPath: in your table view delegate or explicitly exclude the cells you want to have no action if you do implement it. 3 - Further,You can also do it from the storyboard. Click the table view cell and in the attributes inspector under Table View Cell, change the drop down next to Selection to None. If you tap the 3rd row nothing at all happens, the selection will stay on the second row. The functionality is practically a copy of Apple's Calendar app's add event time selection screen. To disable the cell's selection property:(While tapping the cell). and you can also set selection style using interfacebuilder. I am using this, which works for me. And should not allow the user to interact with the cell. You Can also set the background color to Clear to achieve the same effect as UITableViewCellSelectionStyleNone, in case you don't want to/ can't use UITableViewCellSelectionStyleNone. This may degrade your performance as your adding an extra colored view to each cell. 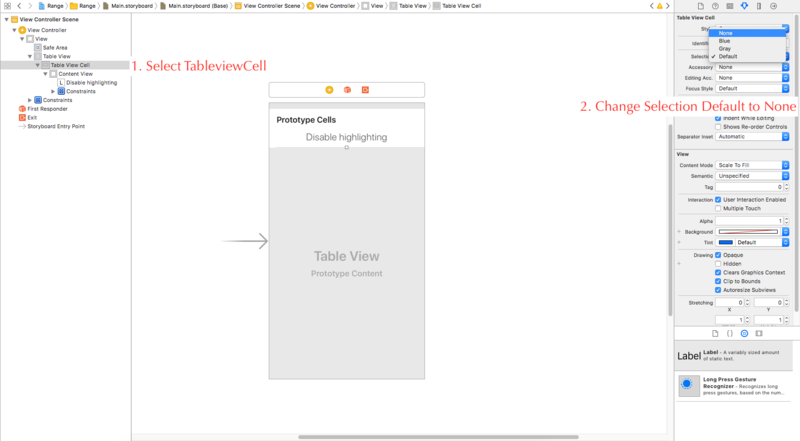 in the cell for row at index path method of your UITableView. in the tableview didselectrowatindexpath method. You can also do it from the storyboard. Click the table view cell and in the attributes inspector under Table View Cell, change the drop down next to Selection to None. selectionStyle in iPhone UITableViewCell selectionStyle when editing? Can you make TableViewCells not be able to be Selected? 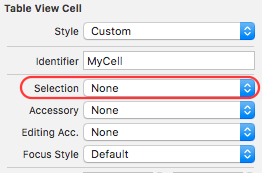 Can I make a cell of a UITableViewCell not be selected? How to make cells in UITableView not turn blue? How do I remove UITableViewCell action on finger tap? How do I prevent a UITableViewCell from being selectable? How to focus a UICollectionViewCell in UITableViewCell in tvOS? Can you animate a height change on a UITableViewCell when selected? Can I disable the UITableView selection of the individual cell?